Add pumpkin and apple juice to high powered blender and blend until smooth. Add this and remaining ingredients to a mixing bowl and mix until well combined. A soft and fluffy dough should be the result. Carefully shape into donuts or donut holes, trying not to compress too much. Place onto non-stick dehydrator sheets. Dehydrate at 115 degrees for 2 to 3 hours until dry enough to place on screens. Dehydrate for another 8 to 10 hours. Donuts should be lightly crispy on the outside and moist on the inside. Mix ingredients in a bowl. 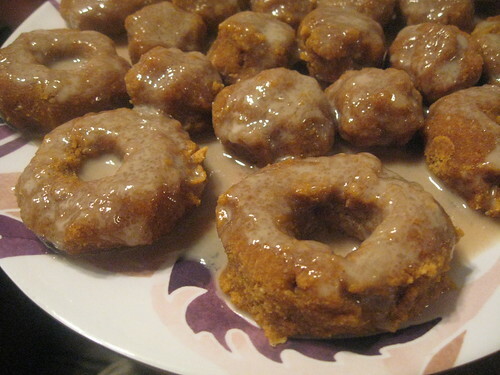 They will separate a bit so mix quickly and pour over cooled donuts for a glazed effect. For more of a frosting allow the glaze to solidify a little and then mix, carefully spreading over the donuts. These are best eaten right away, just like the old-fashioned fried ones! Mix together cacao butter, almond butter and honey until creamy. Blend coconut flour and salt and then stir into the butter mixture. Mix in cacao paste and gojis until well combined. Take small handful of dough and shape into a cookie shape. 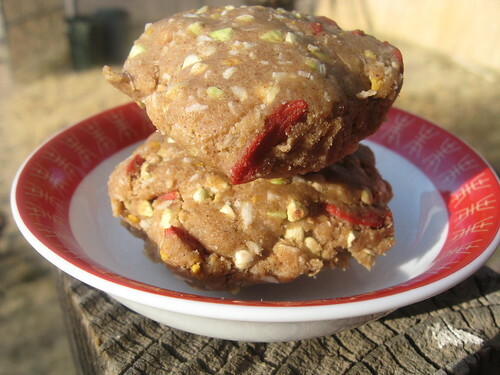 Once all cookies are shaped let chill in the refrigerator for at least 30 minutes. 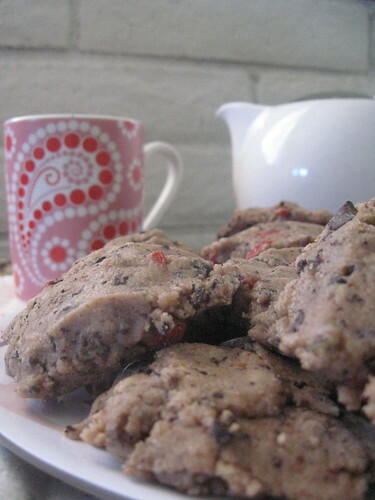 Very tasty with a glass of almond milk or herbal chai. Coconut flour is very rich in fiber so is best eaten with a beverage. Add ingredients one at a time to a bowl. I massaged the ingredients in with my hands because the batter becomes quite thick and hard to stir. Once everything is well-combined press batter into cupcake or mini bundt cake molds. 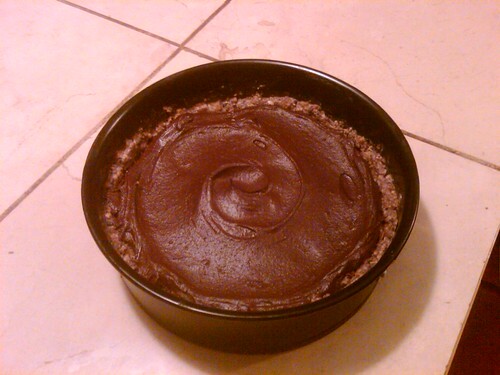 I use the silicon baking molds because I find they are easy to remove raw desserts from. Let cupcakes chill while you make the frosting. First grind cashews down in a food processor, until it starts to clump together. Add remaining ingredients except water and process until well combined. While the food processor is running slowly pour in water. The frosting will be soft and creamy. Allow frosting to set for 15 to 30 minutes in your refrigerator until set enough to spread easily on cupcakes. 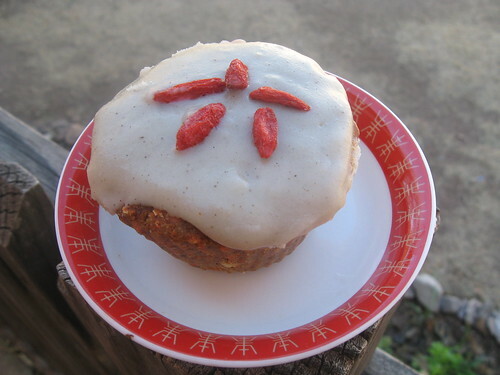 Frost cupcakes and decorate with Goji Berries or Jarrah Bee Pollen. OR 2 dessert spoons of nutritional yeast flakes. Simply blend it all together until it makes a smooth paste! Pour chai into a mixing bowl. 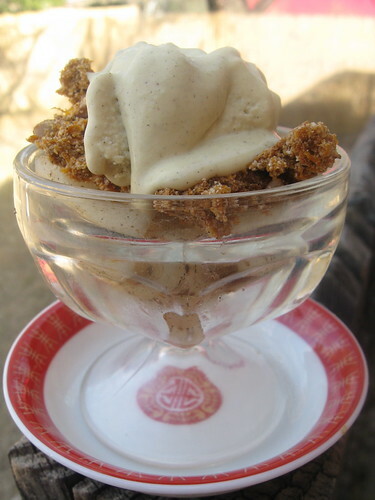 Whisk in sweetener and tahini. The tahini will not completely dissolve, that is fine. Next whisk in chia seed, mix in until well combined. Let sit for a few minutes and then whisk briskly again. You will notice that the chia has started to thicken. Whisk every few minutes until a pudding-like consistency has been achieved. You can add a little more chia if you prefer it thicker. Once the chia has thickened add in a handful of mulberries and a handful of coconut flakes. From here you could go in two directions. For a breakfast porridge put a serving of the chai chia in a bowl and drizzle on a little more tahini and perhaps a little more coconut or mulberries. For a light dessert a dollop of whipped cream(scroll down for the whipped cream recipe) and a sprinkle of vanilla powder. Combine all ingredients in a bowl. Shape mixture into cookie shapes with wet hands. Let cookies set in the refrigerator for a few minutes. Excellent with a cup of nutmilk. Grind cashews in food processor until really broken down. Add remaining ingredients except cilantro & basil. Process until smooth. Add cilantro and basil and pulse food processor until herbs are mixed in but not completely smooth. Wash and dry collard leaves. Cut the stem from each collard leaf, keeping each half of the leaf for the wrap. I save the collard stems for my morning juice! Mix olive oil & salt in a small dish. Rub each collard leaf half with a little oil & salt. Once all of the greens are prepared place one collard leaf half on a cutting board. Spread some cashew spread along 1/3 of of the leaf. Pile on a few slices of cucumber & red pepper and a nice clump of kim chee. 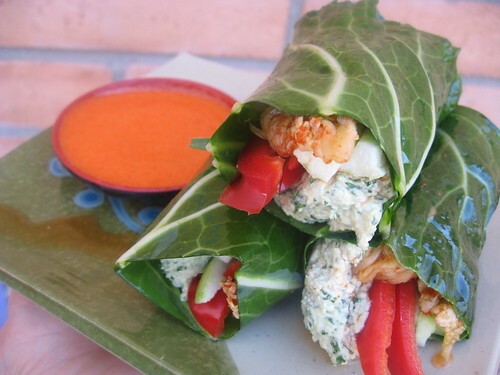 Carefully roll the leaf around fillings, set aside and finish the rest of the rolls. Juice the pineapple & ginger. Soak goji berries in juice for 30 minutes. Process gojis and juice along with remaining ingredients in high speed blender until sauce is smooth. For the crust: Place Deep Earth Trail Mix in a food processor. Process until a crumbly, coarse texture achieved. Mix ground trail mix in with cacao butter. Spread mixture in a pie tin to form a crust. Put tin in freezer to set crust. For filling: Place remaining ingredients in food processor except for the coconut water or nutmilk. Process and add liquid through spout to facilitate blending. Filling should be smooth but thick, like ganache. Once pie crust is set spread filling in the crust evenly. Garnish with coconut chips. Let set in refrigerator until filling is firm. Combine Irish Moss Powder & water and set aside. Soak goji berries in orange juice for 5 minutes. 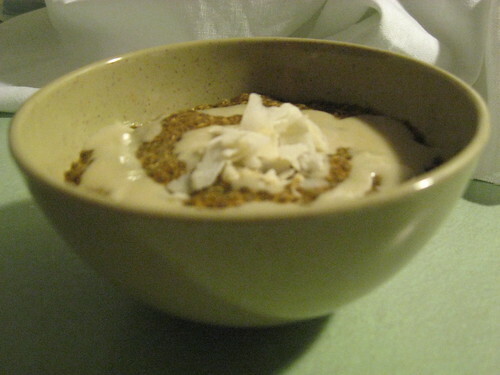 Combine Irish Moss mixture, gojis & juice with remaining ingredients in a high powered blender. Blend on high until smooth. Store in a glass jar and allow to thicken over night. This will not “gel” like a traditional cranberry sauce. It will be a thick but pour-able consistency. Delicious with raw, wilted greens. Put everything in a bowl and mush together with your hands. When well-combined form into little cookie sized patties and chill for a few minutes. Excellent with a spot of tea. Place mushrooms, broccoli, red pepper and scallions into a large bowl. 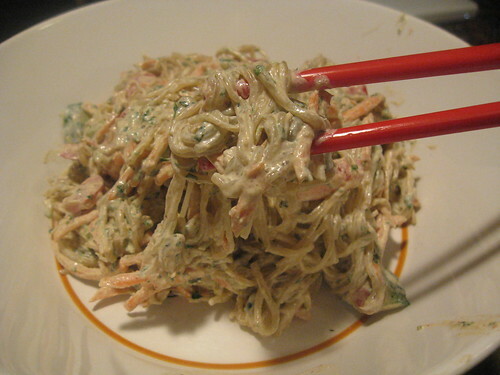 Drain kelp noodles and chop them up into more manageable lengths. Add noodles to bowl. Place drained cashews, tomatoes, salt, oil, curry, lime juice, parsley and water into a high-speed blender. 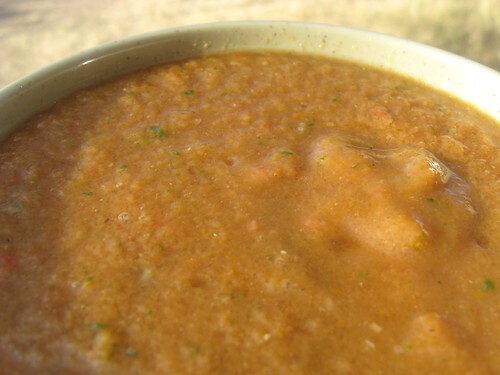 Blend on high until sauce is creamy. Pour over noodles and veggies and combine well. Garnish with additional parsley. (Or you can use the oven, simply set it on to the lowest setting (no more than 110°F) and leave the door open a bit for air flow). Use a cake tin (12″ for this recipe) as a guide for the shape, pour the mixture on to the tray, then take the cake tin away to be left with a perfect pizza shape! Simply combine it all together using a Vitamix/any kind of blender. Pour chia gel into a serving bowl and mix in pecan butter until well combined and creamy. Stir in everything else and eat it up! Put everything except basil into a high-speed blender. This recipe will fill it up so you might not need all of the coconut water. Blend until smooth. Add basil in and blend but just for a moment until the basil is well combined but leaving some bits. Garnish with nutritional flakes, sea lettuce flakes and Spirulina Crunchies. I like a hefty serving of kale chips alongside. If you have family or friends who liked something cooked with their raw my family enjoyed this with some Brown Rice pasta. Place all ingredients in a bowl & toss well. Allow to marinate for at least 30 minutes, tossing occasionally. Place marinated mushrooms on a teflex sheet and dehydrate for 3-6 hours. Place all ingredients into container of a food processor. Pulse until well-combined and a crumbly, stuffing-like consistency is achieved. Place all ingredients into a food processor container. Pulse until well combined but still with some texture. Take a half of a chard leaf and place a small pile of pecan stuffing, a spoonful of cranberry chutney and a sprinkling of dehydrated mushrooms on the top third of the leaf. 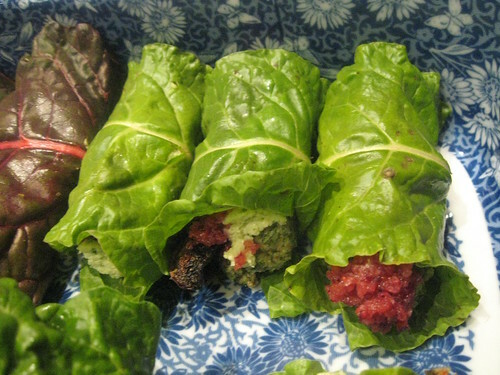 Roll the leaf carefully around the filling. Do this until you run out of filling. Place all ingredients in a food processor and process until everything is well combined and the pecans broken down but still a little coarse. Press this into a springform pan that has been lined with parchment paper. Place in the refrigerator and allow to set while you make the filling. Place all ingredients in a high speed blender and blend until smooth. Pour on top of crust. Return to the refrigerator until set, this can take quite a few hours. Make sure it is completely set before adding topping. Add cashews to a food processor, grind until almost turning into butter. Add remaining ingredients and process. Slowly pour in orange juice while the machine is running. Process until creamy. Spread this over the well set filling and decorate! 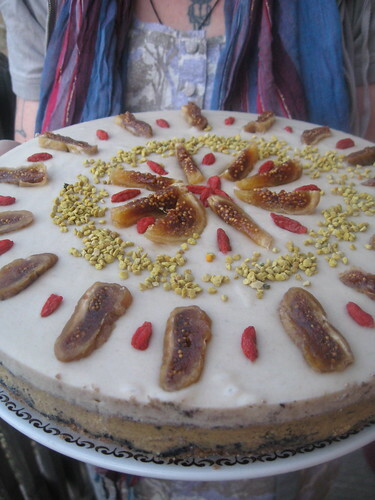 I garnished mine with Turkish Figs, Jarrah Bee Pollen and Goji Berries! Combine all ingredients except pecans in a food processor, process until well-combined. Add pecans and pulse until well combined. Take mixture and crumble it onto a teflex sheet. Dough should be around bite sized pieces. Dry in dehydrator until quite dry, soe moistness is the middle is nice but the outside should be dry. This will take between 6 and 12 hours. Add all ingredients into a high-speed blender and blend until smooth. Allow to set in freezer while you assemble the rest of the trifle. Combine pear slices, lemon juice and vanilla powder and toss gently in a bowl. In a small trifle bowl place 1/2 of the pear mixture along the bottom. Add half of the pumpkin mixture next and then half of the creme. Repeat this order with the remaining ingredients. Allow the mixture to sit for a few hours in the refrigerator at least for the layers to settle together. 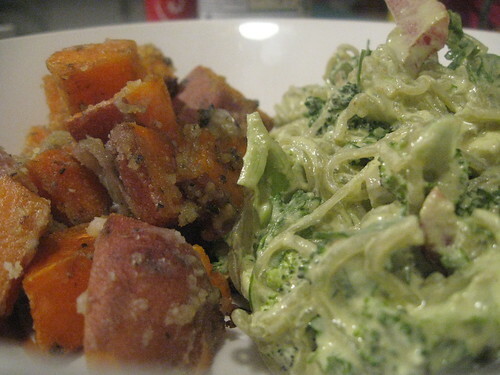 Combine ingredients in a food processor and pulse until a coarse texture has been achieved. Wash and drain fresh berries. Cut strawberries into bite-sized pieces. Toss everything in a bowl. Mix the syrup in with the fruit until well combined being sure to be gentle with the fruit so it stays in chunks. Place fruit mixture into a serving dish. 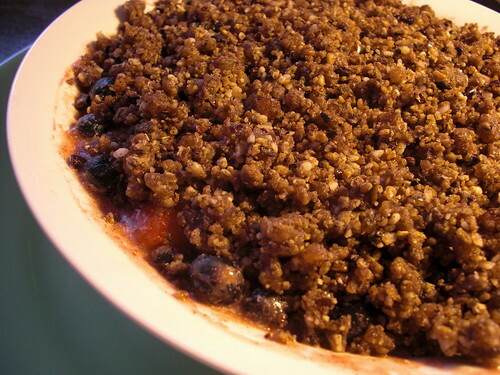 Evenly distribute the crumble over the fruit. Sprinkle bee pollen over the crumble just before serving at room temperature. Combine ginger, lime juice, olive oil, sweetener, tamari, vinegar, peanut butter and salt in a food processor. Start processing. While the food processor is running pour in water. Sauce should be thick and creamy when processed enough. Add in cilantro and pulse until well combined but not smooth, little flecks of cilantro should be seen. Next, drain noodles and combine noodles & sauce with remaining ingredients in a large bowl. Excellent with a side of kim chee or even wrapped in Nori. There was a sale on stoneground tahini, nori and spirulina crunchies. At the bottom of the email was a recipe for vegan BLT. I cant find the recipe!!!! Does anyone have it? You have some great recipes here – I’ve been eating raw for about 3 years and have set up a website, for fun really but to spread the word about the advantages of eating raw (and some cooked) vegan food. Hi Madeleine! Thanks so much, so glad you enjoy our recipes 🙂 Your site looks great, thanks again for spreading the word! Hi Madeline, Your post is almost two years old. Do you still have your website> If so, please let me know how to access it. I would like to eat raw, but need more tips; can you help me?